Web Shop » Temperature Sensors & Accessories » Thermocouple Temperature Sensors » Industrial Thermocouples » Industrial Thermocouples with IP67 head, 6mm dia. 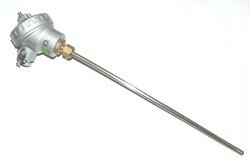 Industrial Thermocouples with IP67 head, 6mm dia. Industrial thermocouples suitable for a wide range of industrial processes, 6mm diameter, in 250mm, 500mm, 750mm, 1000mm and 1500mm immersion lengths. Type J & K have 25/20 stainless steel sheaths and type N have inconnel sheaths, they are capable of withstanding temperatures in the range of -100°C to +1100°C. All units are fitted with compact weather-proof connecting head to IP67. We can also shorten these stock probes to custom lengths, please contact us for a quote with your required length and quantity.